Cars, trucks and buses take priority over boats from 7 to 9 a.m. and 4 to 6 p.m. on the Ballard, Fremont and University bridges. SDOT says those hours no longer reflect rush hours. Seattle’s transportation director wants to improve north-south vehicle traffic by opening the city-owned Ballard, Fremont and University bridges less often for pleasure boats. Currently, the bridge decks stay down from 7 to 9 a.m. and from 4 to 6 p.m. weekdays, under U.S. Coast Guard regulations that have existed for decades. Huge commercial vessels of more than 1,000 tons may request openings at any time. Those four hours no longer reflect growing traffic congestion or extended commute times, the Seattle Department of Transportation (SDOT) argued in a statement Tuesday. The city of Seattle is seeking comments from the public through Sept. 30 at this email: ShipCanalBridgeOpenings@seattle.gov. Scott Kubly, the SDOT director, plans to seek Coast Guard permission to use a system of scheduled bridge openings, instead of raising drawspans on demand with as little as 10 minutes’ notice. That way, there would be fewer openings, and more boats would pass each time. For instance, the Fremont Bridge might be raised just once instead of twice between 6 and 7 p.m.
“The pleasure craft, we want to have scheduled openings so people in their boats know when to show up, and motorists can plan accordingly,” Kubly said. The city expects to file its petition with the Coast Guard by Nov. 1. As an example of how early-evening openings slow traffic, the city noted that in the last week of August 2014, the Ballard Bridge opened 11 times between 6 and 7 p.m. on weekdays, mostly for sailboats, while an average 2,600 vehicles crossed during that same hour. Congestion tends to stretch one mile on either side, causing pollution from idling cars. The average opening lasts 4.8 minutes and can require 10 minutes for traffic to clear, said John Buswell, the city’s head of roadway structures. Still, Kubly may find it difficult to persuade the federal government to encroach on marine travel, which dominated Seattle before the auto age. The Ballard and Fremont bridges were built in 1917, the University Bridge in 1919 — shortly after the Lake Washington Ship Canal and Ballard Locks enabled crosstown navigation. Vessel movement is paramount in U.S. codes, said Lt. Cmdr. Steve Fischer, Northwest bridge administrator for the Coast Guard. Fischer said he has no opinion about SDOT’s proposed change, until he examines the bridge logs, traffic counts and other facts. To revise the Ship Canal’s drawspan rules would require a formal change to the Code of Federal Regulations, he said. “It could easily take a year,” he said. Kubly said he will petition the Coast Guard to conduct a pilot project for scheduling pleasure craft. The Montlake Bridge, which likewise spans the Ship Canal, is operated by the Washington State Department of Transportation — but, logically, changes affecting the three city bridges would affect some Montlake-area travel. An average 112,000 cars and buses cross the three city bridges combined per weekday, and the Fremont Bridge served 2,823 bicycle trips Monday. Besides car traffic, King County Metro Transit gets caught in the Ballard Bridge backup, delaying bus arrivals as far ahead as Belltown and even West Seattle. The Fremont Bridge opened some 655 times in June, which equals about 22 a day or twice per available daylight hour, Kubly said at his news conference there Tuesday. SDOT’s proposal doesn’t include the city-owned lower West Seattle Bridge, the state’s First Avenue South bridge or King County-owned South Park bridge, all over the Duwamish River. The Coast Guard previously denied the city’s 2008 request to ban span openings at the West Seattle swing bridge during peak commute hours. Federal officials heeded complaints from the Port of Seattle and marine interests, which said high-value industrial ships and barges need to travel when tides are high. The Coast Guard also defended access for vessels to use the former Highway 520 bridge central drawspan. Calls and emails to five boating clubs, seeking their comments, weren’t immediately answered Tuesday afternoon. Kubly, who grew up in Texas and managed projects for Chicago’s transportation department, said busy Seattle drawbridges are a new experience since he arrived last year. 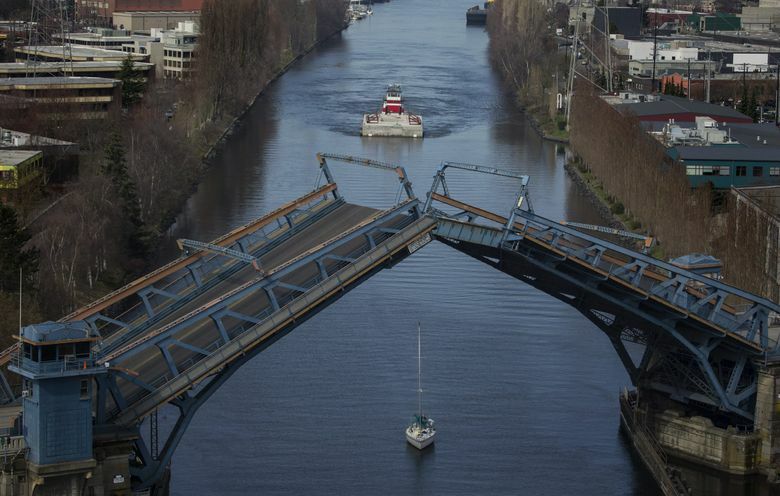 “I’ve been stuck behind enough bridges that I started asking questions,” he said. The city is seeking comments from the public through Sept. 30. Fischer said he would also send a notice to mariners to get their comments as well.